I want to quote huge chunks of this documentary at you. I want to explain all the reasons why you have to see it. But to fully explain, I'd need to watch it five more times after I can find it on DVD. If it happens to be screening at a cinema near you, go see it. This documentary knocked my socks off. Jiro Ono owns a 10-seat-only sushi restaurant, hidden away in an underground station in Tokyo, Japan. It has the much coveted three stars from Michelin. To put it simply, Jiro's sushi is the best there is. They take bookings a month in advance due to the demand. 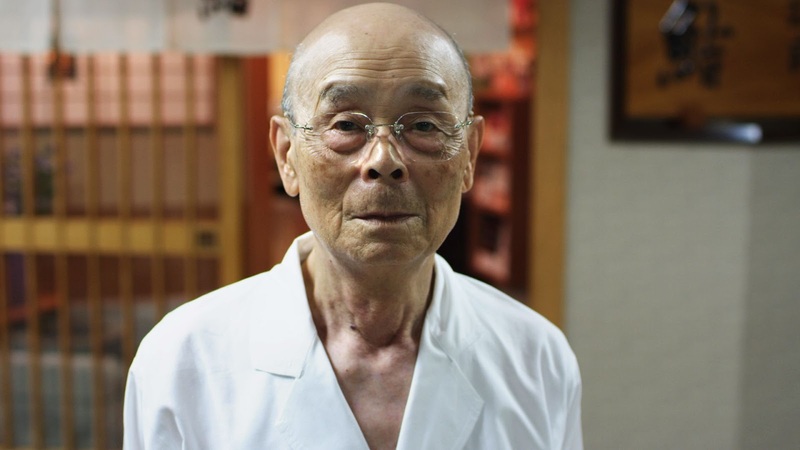 And Jiro is still innovating, even at 85 years old. There's nothing fancy about his Sushi, but he's an expert. They get their rice from an expert rice dealer. This is a dealer who won't sell rice to someone if he doesn't think they'll cook it right. Just like when Jiro buys tuna or salmon or an octopus, he only buys the best. He's got trusted contacts who will only sell him the best stuff. He has apprentices at the restaurant. He trains them up---- for ten years. It's just like in the movies, they learn from their master. It starts with mundane stuff and eventually, years later, they're allowed near the rice. Then if they work hard, they can touch the eggs. In our society, we're slaves to money. Not only do we need it to survive and thrive, but we want more than everyone else. But Jiro just cares about making the best sushi. And if they lose profits because they keep chucking out tuna that doesn't make the grade, well that's just the way it goes. No customer ever has a disappointing meal at his restaurant. The food is prepared individually for each visitor. And if Jiro is away from work (which is almost never), his fifty year old son is there, and he's learned everything his father has to offer. Jiro speaks eloquently at the beginning of the movie about how, once you've chosen a path of work, you have to dedicate everything to it. You have to constantly learn and improve your craft. And of course I related it to filmmaking. I couldn't get over his simplicity. The sushi isn't a mystery, it's just done expertly. The most talented and experienced sushi maker, with the greatest kitchen staff, and the best rice and fish available. And an endless dedication to getting it right. Complacency is not an option where Jiro is concerned. How often is the food we eat truly a labour of love? Even in the expensive restaurants, it's often just appearances, a nicer plate and a pretty looking salad. Jiro has dedicated his life to his restaurant. To giving his ten customers an unforgettable experience. Jiro shows us how to live, how to be a success, how to mean something. I saw this movie in the fall. LOVED IT! And I didn't love it just because I love sushi either. As you said, it's in the implicitly. So many thought provoking thoughts here. "[o]nce you've chosen a path of work, you have to dedicate everything to it. You have to constantly learn and improve your craft." nails it. From the moment I saw this, I've wanted a table in Jiro's restaurant. Or to learn to REALLY make sushi. I'm going to have to watch this one. I've worked in sushi restaurants for years, so I'd be fascinated to hear from such an expert. And I applaud what you said about how our society works for the top dollar, unlike what Jiro presents. Can't wait! Sounds like a very interesting documentary. Thanks for telling us all about it - will have to try and source a copy now!